This is an overview of a recently published article about a new treatment for ulcerative colitis. It also reviews the use of a class of drug in inflammatory conditions, and introduces the problem of sepsis. Tofacitinib, an Oral Janus Kinase Inhibitor, in Active Ulcerative Colitis. Ulcerative colitis is a chronic inflammatory disease of the colon that belongs to a group of diseases lumped together as Inflammatory Bowel Disease (IBD). There is a distinction to be made between Crohn’s disease, which may be limited to the small intestine (regional enteritis), the terminal ileum, or a portion of the transverse colon, and ulcerative colitis. 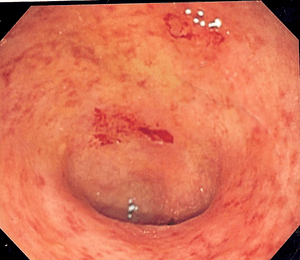 In ulcerative colitis the inflammation is limited to the mucosa and submucosa, but in Crohn’s disease there is a deep penetration of the intestinal wall (fistula) that may extend to the peritoneum causing abscess, scarring, peritonitis and possibly volvulus, obstruction and gangrenous bowel, which necessitate surgical resection. IBD tends to occur in children and young adults, repeats in families, and requires dietary management (fluid intake, Metamucil, restriction of fiber) . It is characterized by abdominal pain, diarrhea, bleeding, weight loss, and episodic fever, but also may be associated with joint pain. Conservative medical treatment focuses on suppressing the immune response using 5-ASA, azathioprine, 6-mercaptopurine. If severe, biologic therapy is used to treat patients with severe Crohn’s disease that does not respond to any other types of medication, such as a TNF (tumor necrosis factor) inhibitor which can have secondary effects, and they are not universally effective. The importance of immunity can’t be understated, it involves a large portion of immune system and primitive Toll-like receptors (TLRs) that trigger signaling pathways. TLRs represent an important mechanism by which the host detects a variety of microorganisms that colonize in the gut. Endothelial and epithelial cells, and resident macrophages are potent producers of inflammatory cytokines, interleukins, IL-1, IL-6, and TNF-α, which are distinguished from another set that is treated in this study. In addition, there is a balance that has to be achieved between suppression and upregulation in treatment, which is referred to as immunomodulation. The opposite of immunosuppression is upregulation It is cental to recent advances in chemotherapy of melanolma, small cell carcinoma and NSCCL of lung, and treatment resistant prostate cancer. An example is ipilimumab, whic upregulates cytotoxic T-cells to destroy cancer cells, but it has runaway destructive effects on the GI tract. This study investigates the use of tofacitinib (CP-690,550), an oral inhibitor of Janus kinases 1, 2, and 3 with in vitro functional specificity for kinases 1 and 3 over kinase 2, which is expected to block signaling involving gamma chain–containing cytokines including interleukins 2, 4, 7, 9, 15, and 21. These cytokines are integral to lymphocyte activation, function, and proliferation. Jak 1 and 3 inhibitor, which is targeted at blocking signaling involving gamma chain–containing cytokines including interleukins 2, 4, 7, 9, 15, and 21. The result would be to block signaling involving (gamma chains)–suppressing “lymphokines” 2, 4, 7, 9, 15, and 21. The lymphocyte pool is regional, being the antibody mediated immune system of the Bursa of Fabricius (B-lymphocytes, as opposed to the thymic derived T-cells) that form the largest immune organ extending the length of the intestines and the stomach. The family transmission suggests an epigenetic event. However, this classification of the lymphocytes has much greater complexity than I indicate. The so called B-cells have receptors that recognize foreign antigen, but the T-cells have similar receptors and are tied to both the innate and the adaptive immune response. Lymphocytes are the predominant cells of the immune system, but macrophages and plasma cells are present also. Lymphocytes circulate, alternating between the circulatory blood stream and the lymphatic channels. The end result of the immune reaction is the production of specific antibodies and antigen-reactive cells. These cells are called lymphocytes and are found in the blood and in the lymphoid system. Trial features: double-blind, placebo-controlled, phase 2 trial; Patients were randomly assigned to receive tofacitinib at a dose of 0.5 mg, 3 mg, 10 mg, or 15 mg or placebo twice daily for 8 weeks. Study goal: evaluated the efficacy of tofacitinib in 194 adults with moderately to severely active ulcerative colitis. Primary outcome: a clinical response at 8 weeks, defined as an absolute decrease from baseline in the score on the Mayo scoring system for assessment of ulcerative colitis activity (possible score, 0 to 12, with higher scores indicating more severe disease) of 3 or more and a relative decrease from baseline of 30% or more with an accompanying decrease in the rectal bleeding subscore of 1 point or more or an absolute rectal bleeding subscore of 0 or 1. Results and conclusion: The primary outcome, clinical response at 8 weeks, occurred in 32%, 48%, 61%, and 78% of patients receiving tofacitinib at a dose of 0.5 mg (P=0.39), 3 mg (P=0.55), 10 mg (P=0.10), and 15 mg (P<0.001), respectively, as compared with 42% of patients receiving placebo. Clinical remission (defined as a Mayo score ≤2, with no subscore >1) at 8 weeks occurred in 13%, 33%, 48%, and 41% of patients receiving tofacitinib at a dose of 0.5 mg (P=0.76), 3 mg (P=0.01), 10 mg (P<0.001), and 15 mg (P<0.001), respectively, as compared with 10% of patients receiving placebo. Three patients treated with tofacitinib had an absolute neutrophil count of less than 1500. Commentary: The study is only phase 2, and it is also limited to disease of the descending colon. The next phase will be necessary to determine the effect on a larger population at the selected dose, and will be necessary to determine both the size of the effect and identify unexpected adverse effects. We also have to keep in mind that the success of the study would limit the treatment to a subset of patients with IBD. it is effective at about 40% remission for 8 weeks compared to 10% for placebo, or an adjusted actual 30% for 8 weeks. A much larger study needs to be done to see how well the dose holds up, as well as the dosing interval. There are two factors that will affect the t1/2 of the drug so that 1/2 dose could be replaced at the end of t1/2. The dose of 15 mg was no better for clinical response. I would think that the next trial might give a loading dose of 15 mg, and then 7 mg (better that 3 mg) would be replaced every t1/2. But this is more complicated than usual. I identified two steps, not one direct effect. The inhibitor has to balance the production rate versus the removal rate of the T-cell population. The drug itself is not measured, only the effect. I know that albumin, the liver produced protein, has a half-life of removal of 21 days. Platelets are short shelf-life as well as rapid turnaround in plasma. I don’t know what is the local production and removal rate of lymphocytes in the gut. That would be the key determinant for dosing. Common characteristics of the lymphoid system. The lymphoid system involves organs and tissues where lymphocytic cells originate as lymphocyte precursors that mature and differentiate, and either lodge in the lymphoid organs or move throughout the body. Precursor cells originate in the yolk sac, liver, spleen, or bursa of Fabricius (or its mammalian equivalent, the bone marrow) in an embryo or fetus. Stem cells from bone marrow or embryonic tissues are deposited and mature into lymphocytes in the central or primary lymphoid organs, which include the thymus and the bursa or bone marrow. Upon maturation, the lymphocytes undergo further maturation toward immunocompetence and production of immunoglobulins or sensitized lymphocytes. If pathogens initially evade constitutive defenses, they may yet be attacked by more specific inducible defenses. The inducible defenses are so-called because they are induced upon primary exposure to a pathogen or one of its products. The inducible defenses must be triggered in a host, take time to develop, and are a function of the immune response. The type of resistance thus developed in the host is called acquired immunity. 1. Specificity. An antibody or reactive T cell will react specifically with the antigen that induced its formation; it will not react with other antigens. Generally, this specificity is of the same order as that of enzyme-substrate specificity or receptor-ligand specificity. The specificity of the immune response is explained on the basis of the clonal selection hypothesis: during the primary immune response, a specific antigen selects a pre-existing clone of specific lymphocytes and stimulates exclusively its activation, proliferation and differentiation. 2. Memory. The immunological system has a “memory”. Once the immunological response has reacted to produce a specific type of antibody or reactive T cell, it is capable of producing more of the antibody or activated T cell more rapidly and in larger amounts. 3. Tolerance. An animal generally does not undergo an immunological response to its own (potentially-antigenic) components. The animal is said to be tolerant, or unable to react to its own potentially-antigenic components. Efficient lymphokine gene expression appears to require both T-cell antigen receptor (TCR) signal transduction and an uncharacterized second or costimulatory signal. CD28 is a T-cell differentiation antigen that can generate intracellular signals that synergize with those of the TCR to increase T-cell activation and interleukin-2 (IL-2) gene expression. These investigators examined the effect of CD28 signal transduction on granulocyte-macrophage colony-stimulating factor (GM-CSF), interleukin 3 (IL-3), and gamma interferon (IFN-gamma) promoter activity. Stimulation of CD28 in the presence of TCR-like signals increases the activity of the GM-CSF, IL-3, and IFN-gamma promoters by three- to sixfold. As previously demonstrated for the IL-2 promoter, the IL-3 and GM-CSF promoters contain distinct elements of similar sequence which specifically bind a CD28-induced nuclear complex. Mutation of the CD28 response elements in the IL-3 and GM-CSF promoters abrogates the CD28-induced activity without affecting phorbol ester- and calcium ionophore-induced activity. These studies indicate that the TCR and CD28-regulated signal transduction pathways, coordinately regulate the transcription of several lymphokines, and the influence of CD28 signals on transcription is mediated by a common complex. Fraser JD, Weiss A. Regulation of T-cell lymphokine gene transcription by the accessory molecule CD28. Mol Cell Biol. 1992 Oct;12(10):4357-63. These investigators looked at the relevance λδ T repertoire and the antigen reactivity of clones isolated from CSF in multiple sclerosis (MS). they found an increased percentage of V delta 1+ cells as compared to peripheral blood of the same donors. Phenotypic analysis of cells from MS CSF with V gamma- and V delta-specific monoclonal antibodies (mAb) showed that the V delta 1 chain is most frequently associated with gamma chains belonging to the V gamma 1 family. Sequence analysis of TCR genes revealed heterogeneity of junctional regions in both delta and gamma genes indicating polyclonal expansion. gamma delta clones were established and some recognized glioblastoma, astrocytoma or monocytic cell lines. Stimulation with these targets induced serine esterase release and lymphokine expression characteristic of the TH0-like phenotype. Remarkably, these tumor-reactive gamma delta cells were not detected in the peripheral blood using PCR oligotyping, but were found in other CSF lines independently established from the same MS patient. in the CSF there is a skewed TCR gamma delta repertoire and suggest that gamma delta cells reacting against brain-derived antigens might have been locally expanded. users.rcn.com/jkimball.ma.ultranet/…/B/B_and_Tcells.htmlShareAIDS; Building the T-cell Repertoire; Gamma/Delta T Cells … T cells specific for this structure (i.e., with complementary TCRs) bind the B cell and; secrete lymphokines that: … Each chain has a variable (V) region and a constant (C) region. T lymphocytes (likewise called T cells). B cells are produced in the bone marrow. The precursors of T cells are also produced in the bone marrow but leave the bone marrow and mature in the thymus (which accounts for their designation). Each B cell and T cell is specific for a particular antigen. What this means is that each is able to bind to a particular molecular structure. the T cell receptor (TCR) respectively. They are integral membrane proteins. They are present in thousands of identical copies exposed at the cell surface. They are made before the cell ever encounters an antigen. They are encoded by genes assembled by the recombination of segments of DNA. How antigen receptor diversity is generated. They have a unique binding site. This site binds to a portion of the antigen called an antigenic determinant or epitope. The binding, like that between an enzyme and its substrate depends on complementarity of the surface of the receptor and the surface of the epitope. The binding occurs by non-covalent forces (again, like an enzyme binding to its substrate). stimulation of the cell to leave G0 and enter the cell cycle. Repeated mitosis leads to the development of a clone of cells bearing the same antigen receptor; that is, a clone of cells of the identical specificity. the type of epitope to which they bind. ……is encoded by several different gene segments. The genome contains a pool of gene segments for each type of chain. Random assortment of these segments makes the largest contribution to receptor diversity. gamma/delta (γδ) T cells. Their TCR is also a heterodimer of a gamma chain paired with a delta chain. The discussion that follows now concerns alpha/beta T cells. Gamma/delta T cells, which are less well understood, are discussed at the end [Link]. The TCR (of alpha/beta T cells) binds a bimolecular complex displayed at the surface of some other cell called an antigen-presenting cell (APC). CD4+ T cells bind epitopes that are part of class II histocompatibility molecules. Only specialized antigen-presenting cells express class II molecules. many cells express class II MHC molecules that also contain self peptides. This presents a risk of the T cells recognizing these self-peptide/self-MHC complexes and mounting an autoimmune attack against them. Fortunately, this is usually avoided by a process of selection that goes on in the thymus (where all T cells develop). The USFDA has approved Abbott’s Humira (adalimumab) for the treatment of adult patients with moderate to severe Ulcerative Colitis (UC) when certain other medicines have not worked well enough. Humira, which works by inhibiting tumour necrosis factor-alpha (TNF-alpha), was previously approved for the treatment of moderate to severe Crohn’s disease. The approval was based on the data from two phase 3 studies, ULTRA 1 and ULTRA 2, both of which enrolled adult patients who had moderately to severely active UC despite concurrent or prior treatment with immunosuppressants. This should have special significance in view of the past history, which may be explainable, but also keep in mind the serious risks of complications. It is worthy of comment that anti-TNF treatment was previously rejected in trials for use in sepsis leading to Multiple Organ Dysfunction Syndrome and cardiovascular collapse (shock). More recently an anti-Factor Xa drug, Xygris, to prevent hypercoagulability only in severe sepsis was withdrawn. 1. In a group of patients with elevated interleukin-6 levels, the mortality rate was 243 of 510 (47.6%) in the placebo group and 213 of 488 (43.6%) in the afelimomab group. Using a logistic regression analysis, treatment with afelimomab was associated with an adjusted reduction in the risk of death of 5.8% (p = .041) and a corresponding reduction of relative risk of death of 11.9%. Mortality rates for the placebo and afelimomab groups in the interleukin-6 test negative population were 234 of 819 (28.6%) and 208 of 817 (25.5%), respectively. In the overall population of interleukin-6 test positive and negative patients, the placebo and afelimomab mortality rates were 477 of 1,329 (35.9%)and 421 of 1,305 (32.2%), respectively. Panacek EA, Marshall JC, Albertson TE, Johnson DH, at al. Efficacy and safety of the monoclonal anti-tumor necrosis factor antibody F(ab’)2 fragment afelimomab in patients with severe sepsis and elevated interleukin-6 levels. Crit Care Med. 2004 Nov;32(11):2173-82. 2. No survival benefit was found for the total study population, but patients with increased circulating TNF concentrations at study entry appeared to benefit by the high dose anti-TNF antibody treatment. Increased interleukin (IL)-6 levels predicted a fatal outcome (p =.003), but TNF levels were not found to be a prognostic indicator. TNFlevels were higher (206.7 +/- 60.7 vs. 85.9 +/- 26.1 pg/mL; p <.001) and outcome was poor (41% vs. 71% survival; p =.007) in patients who were in shock at study entry when compared with septic patients not in shock. 3. Large clinical trials involving anti-TNF-alpha MAb have proven to be less conclusive and less successful than clinicians had hoped. The International Sepsis Trial (INTERSEPT), reported by Cohen and Carlet, was designed to assess the safety and efficacy of Bay x 1351, a murine MAb to recombinant human TNF-alpha in patients with sepsis. The INTERSEPT trial was an international, multicenter trial involving 564 patients, 420 of whom were in septic shock. The main study end point — 28-day survival — showed no significant benefit for the treatment group vs controls. Prospectively, the researchers identified 2 secondary variables: shock reversal and frequency of organ failure. Post-28-day survival, treatment groups showed a more rapid reversal of shock compared with placebo, as well as a significant delay in time to first organ failure. The researchers concluded that the anti-TNF-alpha antibody may have a role as adjunctive therapy, but that such a putative role requires more in the way of clinical trial confirmation. In the TNF-alpha MAb Sepsis Study Group trial, also called the North American Sepsis Trial I (NORASEPT I), Abraham and associates evaluated the efficacy and safety of an anti-TNF-alpha MAb in the treatment of patients with sepsis syndrome. A total of 994 patients in 31 hospitals were enrolled in a randomized, prospective, multicenter, double-blind, placebo-controlled clinical trial. Patients were stratified into shock/nonshock subgroups, then randomized to receive a single infusion of 15 mg/kg of anti-TNF-alpha MAb, 7.5 mg/kg of anti-TNF-alpha MAb, or placebo. The researchers found that among all infused patients, there was no difference in mortality among those receiving therapy and those on placebo. In septic shock patients (n = 478), however, there was a trend toward a reduction in all-cause mortality, which was most evident 3 days after infusion. At day 3, 25 of 162 patients treated with the 15 mg/kg dose died; 22 of 156 treated with 7.5 mg/kg died, but 44 of 160 placebo-treated patients died (15 mg/kg: 44% mortality reduction vs placebo, P = .01; 7.5 mg/kg: 48% reduction vs placebo, P = .004). However, at day 28, the reduction in mortality of shock patients was not significant for either dose of the anti-TNF-alpha MAb relative to placebo. All studies of MAb against TNF in septic patients and found an absolute risk reduction of 3.5%. The most recently published clinical trial found an absolute reduction in mortality of 3.7%. Of note, therapy with MAb against TNF has been proven efficacious for treatment of rheumatoid arthritis and is approved by the US Food and Drug Administration for this purpose. New directions in research on severe sepsis. Human trials with TNF alpha. Medscape. 4. Why the poor results with sepsis? This would be sufficient for another discussion. That can be left for another day. Sepsis syndrome, or sepsis, is an adverse systemic response to infection that includes fever, rapid heartbeat and respiration, low blood pressure and organ dysfunction associated with compromised circulation. susceptible to Gram-negative bacterial infection but, at the same time, are less susceptible to the sepsis syndrome. TLRs have a lethal function in the septic shock syndrome. The physiological function of signaling through phagocyte TLRs is to induce the release of the cytokines TNF, IL-1, IL-6, IL-8 and IL-12 and trigger the inflammatory response, which is critical to containing bacterial infection in the tissues. However, if infection disseminates in the blood, the widespread activation of phagocytes in the bloodstream is catastrophic. Increase in the numbers of circulating neutrophils, or neutrophilia, is driven by effects of colony stimulating factors, such as G-CSF. in the liver, the systemic pituitary response (via IL-6 and IL-1), and the activation and chemotaxis of neutrophils (via IL-6, IL-8 and G-CSF). Neutrophil activation results in the release of lactoferrin from neutrophil secondary granules; the activation of endothelial procoagulants with the rise of tissue plasminogen activator (t-PA). Pituitary-derived adrenocorticotropic hormone (ACTH) and migration inhibition factor (MIF) peak at 5 h and coincide with peak levels of the regulatory cytokines IL-Ra and IL-10 that counteract the release or activity of inflammatory cytokines. Diffuse endothelial activation is shown by the appearance of soluble E-selectin that peaks at about 8 h and remains elevated for several days. The proteins encoded by the deleted genes are listed. SR-A is scavenger receptor A; Hck and Fgr are Src-family kinases with an essential role in integrin-mediated migration of neutrophils out of the bloodstream.